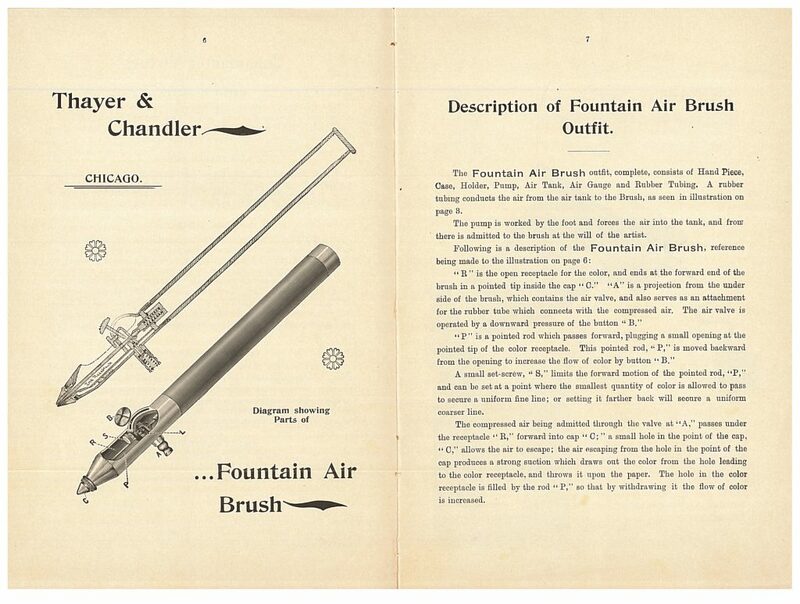 The trade catalog is entitled Fountain Air Brush (circa end of 19th Century) by Thayer and Chandler. It features the Fountain Air Brush, which had several artistic uses. Thayer & Chandler, Chicago, IL. Fountain Air Brush, circa end of 19th Century, front cover showing Fountain Air Brush. Artists, photographers, lithographers, or architects might have used this tool. Photographers could have used it to color photographs or retouch large negatives. Architects could have used it to complete designs and plans. Artists could have used it for portrait work. Depending on the type of texture the artist wanted to create, the air brush made either fine or coarse lines. It had the ability to distribute a small amount of color, such as a hairline, but then quickly adjust to larger amounts, such as one solid half-inch wide band. Thayer & Chandler, Chicago, IL. 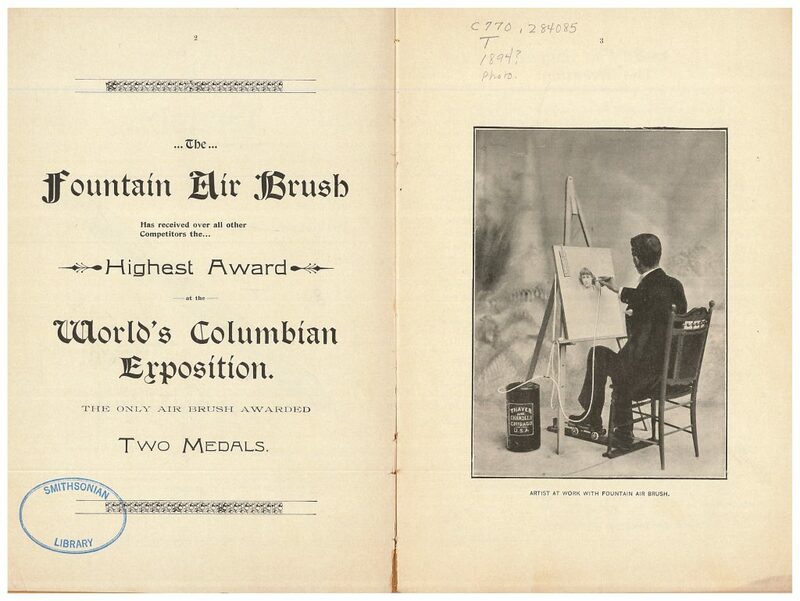 Fountain Air Brush, circa end of 19th Century, pages 2-3, artist using a fountain air brush. The Fountain Air Brush consisted of several parts, including the hand piece, case, holder, pump, air tank, air gauge, and rubber tubing. The air brush was shaped like a pencil but a bit larger. The artist worked the pump by foot forcing air into the air tank, and then the rubber tubing moved air from the air tank to the brush. The diagram marked with letters, below left, illustrates the different parts of the brush. The rubber tubing connected to the brush at a valve where the air entered. There was a small hole in the point of the cap for air to escape which produced a strong suction to draw out and spray the color. The page accompanying the diagram includes detailed information on operating the air brush. In particular, it explains how it produced varying amounts of color. Thayer & Chandler, Chicago, IL. 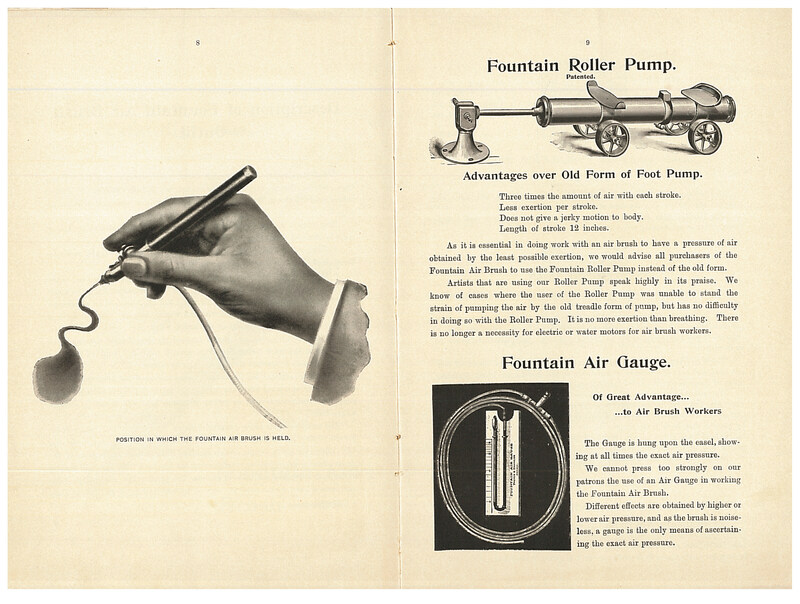 Fountain Air Brush, circa end of 19th Century, pages 6-7, diagram and description of Fountain Air Brush. The artist held the fountain air brush in the hand just like a pen or pencil. It was adaptable for either a right-handed or a left-handed person. The fingers controlled all the necessary movements of the brush while the foot worked the pump. Illustrated below is the Fountain Roller Pump along with the Fountain Air Gauge for measuring the air pressure. Thayer & Chandler, Chicago, IL. Fountain Air Brush, circa end of 19th Century, pages 8-9, proper position to hold Fountain Air Brush and, on opposite page, the Fountain Roller Pump and Fountain Air Gauge. 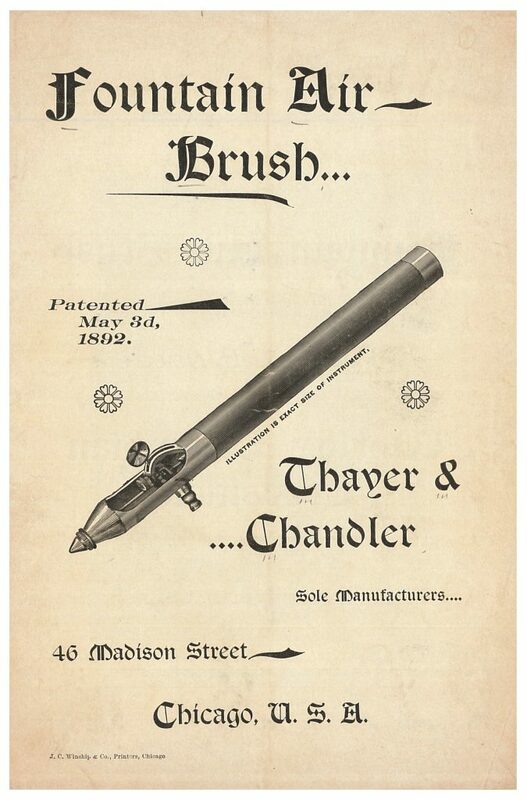 This trade catalog, Fountain Air Brush (circa end of 19th Century), and other trade catalogs about artists’ materials by Thayer & Chandler are located in the Trade Literature Collection at the National Museum of American History Library. This is so incredible!! I can’t believe they had airbrush in 1892! To think it was only a ‘recent’ invention. It’s more like a new and improved on something that was invented quite awhile ago. I’m an airbrush makeup artist myself, in Toronto and I got so excited to see your images of the invention quite awhile ago. I did a google search myself and found that they still make airbrush til this day, I’m quite happy about that! In the makeup artist world, there are certain brands that stick out more than others, so finding this article and new research makes me want to look into Thayer and Chandler more. Thank you for posting this!! It may be of interest to know that I not only own one of these, but I also own the original certificate that was awarded in 1893. I wrote my PhD on the history of the airbrush and they were donated to me by Caleb Petersen who owned the company at that time.